We can store all or any of your belongings from priceless artwork to books, furniture, lawn furniture & equipment, tools, clothes and the like. Our facilities are temperature-controlled, fireproof and secure. All of your items can be valued at an amount that you define. We can also handle your document storage needs with the same efficiency and security. 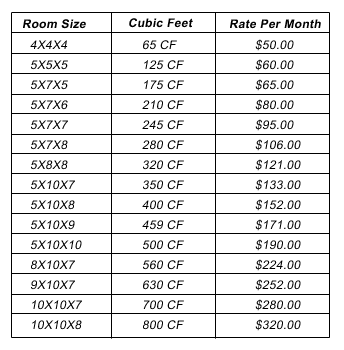 Our prices are very compatible based on cubic feet.